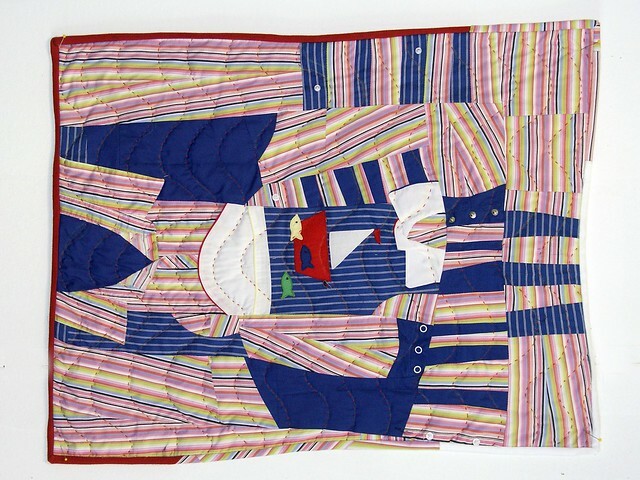 These three quilts were made from the clothing of Jerrod Allen Nickelson, one for each of his three children. With the help of their mother, each child chose specific items that best carried their memory of and relationship to him. What satisfied me most about the process and the outcome is how each quilt evolved uniquely by simply responding to the clothes they picked. The quilts are machine pieced, and hand quilted. 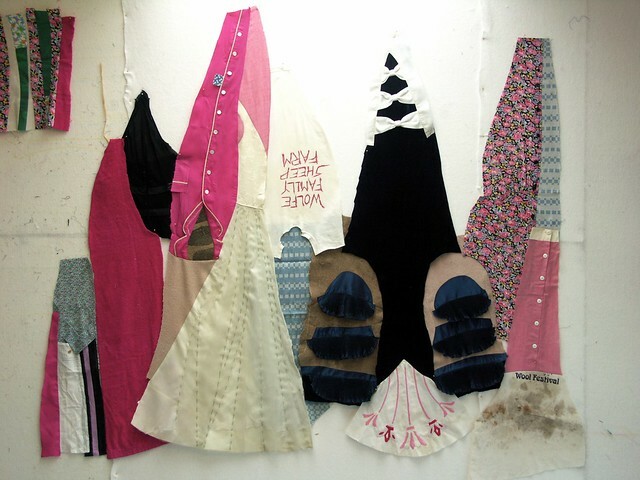 Since 2002 I have been working with people through collaboration, consultation and commission to make improvised quilts from the clothing and materials of everyday life. This practice developed into an active, hands-on, therapeutic process for working through life transitions and bereavement, that I call Passage Quilting. For more information see the Passage Quilting Blog Archive, and Passage Quilting tutorial. Because Rowan's hands chose Sunny's clothes, cut them apart, pieced them back together and participated in the slow process of hand-quilting, the result is not only a memorial to Sunny, but it also embodies the living relationship between them that resides in Rowan's heart. To improve your hand quilting, aim for straight and even stitches and they will naturally get smaller with practice. Sunny's western shirts, Wrangler chambray and a few Pendleton wools are his gift to his grandson, and the score for our quilt improvisation. Just wanted to let you know that we received the quilts today. They are a big hit :) The kids and I love them! The patchwork pattern for these memorial quilts, made from clothing, was improvised to create a sense of flowing waves and light on water. 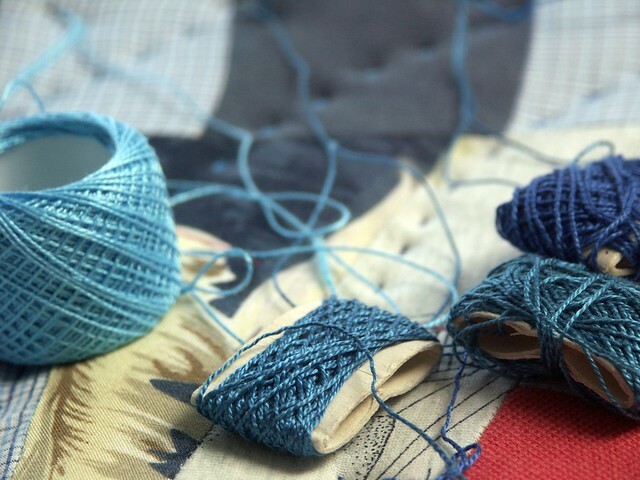 I can't imagine the depth and pain of a client's loss, but I can connect with it compassionately when I'm stitching on their quilt. Last week I facilitated a private bereavement quilt making workshop in Berkeley for a close-knit group, mourning the sudden loss of a dear friend from a car accident. They gathered to remember him and to make three quilts from his clothing to give to his surviving wife and two young children. It was an abundant day, full of sorrow and joy, and plenty of sewing. None had ever made a quilt before so I got them started with a six-hour Passage Quilting workshop. With a little experience under their belts they plan to continue to meet on their own to finish the quilts, which will be given to the family at Thanksgiving. I felt blessed being invited to join them in this sacred work. 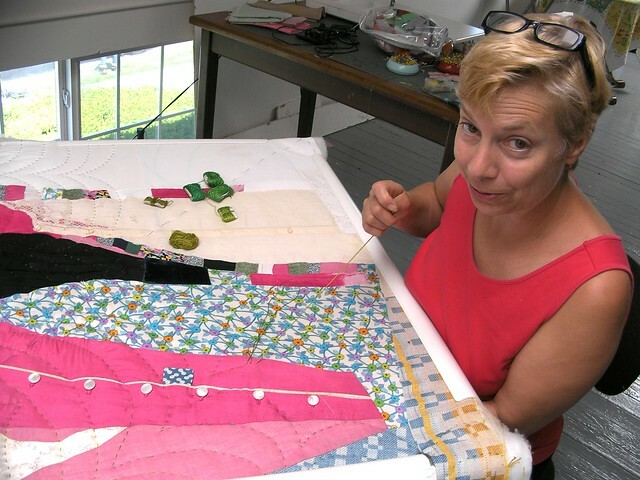 Find out more about the hands-on bereavement process of Passage Quilting. Yesterday Ruth Anne came to the studio to quilt with me on a memorial quilt made from her mother's clothing. I finished the quilt top last month, which was started by Ruth Anne in a Passage Quilting™ workshop, that I facilitated in Cincinnati last fall. We had a great time, talking about her mom, creativity, work, relationships, money and all sorts of topics relevant to two women our age. We quilted about a third of the quilt in a free handed scalloped pattern in shades of green pearl cotton. Ruth Anne is a needle woman in her own right and did a great job quilting. At the end of the day Ruth Anne took the quilt to finish on her own. I pre-made the bias binding from her mother's clothing scraps. Once she quilts and binds, she plans to add embellishments of buttons, and the small charms of the Catholic saints collected by her mother. I can't wait to see how she completes the project. All in all this was a fabulous collaboration between me, Ruth Anne and her dear mother Dolores Wolfe. Check out the evolution of the Wolfe memorial quilt. The Dolores Wolfe memorial quilt is basted and ready to be quilted. Ruth Anne, Dolores's daughter, will be joining me in June to begin the hand quilting as part of her bereavement process. Ruth Anne also wants to explore adding embellishments of buttons and other mementos from her mother's life, which she will be bringing with her from Cincinnati. I really like how the quilt top came out. I didn't expect it to look like this but Ruth Anne's mother had such an interesting contrast of fine formal wear, with fitted and fanciful details, and rugged everyday clothing suited to someone who made her life as a farmer and crafts person. The shapes of Dolores's clothing suggested peaks, and rolling hills, very folksy all in all. I also love the swirling movement of the shapes. Are these mountains or figures dancing? Or as Beth at Smazoochie commented earlier, an old-fashioned family portrait? [slickr-flickr tag="pqwolfedetails" type="slideshow" size="m640" captions="off"] Lots of hand piecing going on, because I completely ignored my rule of thumb to avoid insets... but it's worth it. Follow the evolution of the Wolfe memorial quilt. I've been asked to create a memorial quilt for Ruth Anne from the clothing of her mother, Dolores Wolfe. Ruth Anne began this quilt herself in the Passage Quilting™ Workshop that I taught in Cincinnati last fall. She asked me to continue the quilt and finish it for her. Trees, mountains, peaks, knolls and valleys... Can you see them? Always at the start of something new, a few simple shapes mysteriously bubble to the surface. The unknown begins to be known in this way. A new acceptance of myself, a sense of peace with where I am, renewed attention to my creative life, joy in having my own space to live and grow. In Part 2 of the Mini Keepsake Quilt-Along, improvised sections in all shapes and sizes were pieced and set aside. Now it is time to take those seemingly mismatched sections and begin fitting them together like pieces of a puzzle. Lay out all of the improvised sections on a floor or a work wall. Look for natural fits in shape. Look for places where values and colors bleed between sections, blurring the seam lines between two sections. Use a log cabin type construction to avoid inset seams. When fitting two sections together if one is shorter than the other add a filler to the short section to make it even with the longer section before piecing the two sections together. Likewise trim off a longer section to fit a shorter section. Continue joining and building sections to reach the target size of the finished quilt. Create a filler fabric by piecing strips together from all the materials in the quilt. Mark quilting lines with chalk free hand. Echo a simple pattern. Here I used an undulating wave pattern. Hand quilt with pearl cotton and an embroidery needle. Quilt with big, or sashiko style stitches. 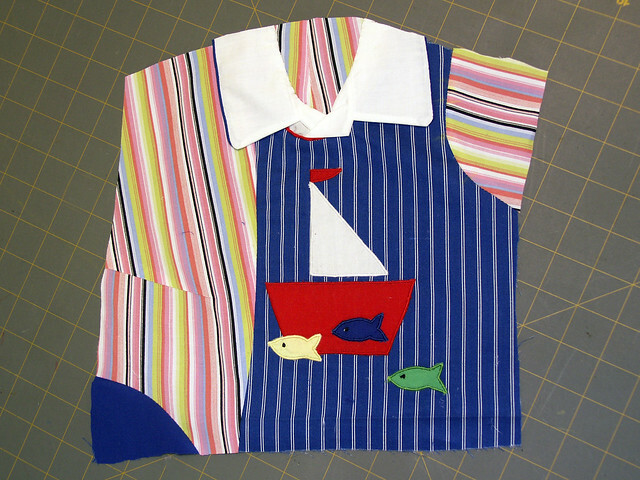 Try a simple fold over binding or create bias binding from scraps of extra clothing. Ties are great for bindings because they are already cut on the bias. I hope you enjoyed this quilt-along, a basic Passage Quilting™ tutorial, and found it helpful. You can also find guidelines for making your very own Mini Keepsake Quilt in Whip Up Mini Quilts, along with all the basic instructions for finishing your quilt. Any questions about the process? Did you present your keepsake quilt to someone special or share it with family and friends? How was it received? 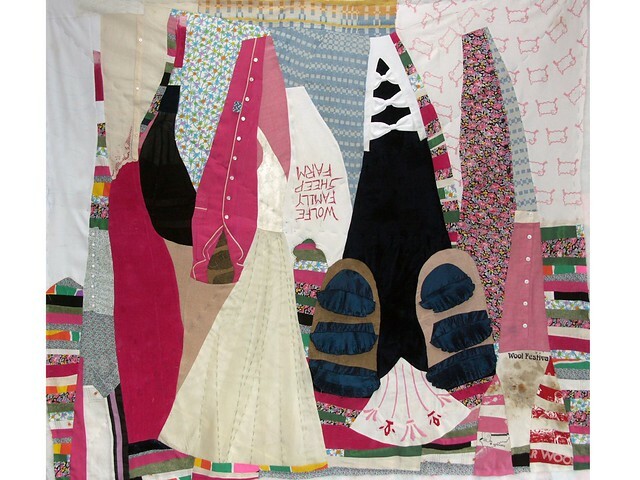 Share an image of your quilt in the keepsake/bereavement quilt group on flickr. In Part 1 of the Mini Keepsake Quilt-Along, I cut my clothing into sections according to the architectural features I wanted to highlight. Now it is time to improvise a pattern based on those features to create blocks or sections. Improvisation is simply creating without a pre-determined pattern. Allow yourself to be surprised by the outcome. There are no mistakes. Follow your heart. Find your rhythm of attention. Start with any feature that resonates strongly with you. Square off your feature by filling in curves or odd angles. Continue to build and add to your section until you reach a sense of completion. Once you complete one section set it aside and start on the next section. Your finished sections should roughly have straight edges, but they can be any size or shape. Fill in the curve of a arm hole with a contrasting fabric. Layer fabrics right sides up to cut the line of the curve. Leave a 1/4 inch over hang on filler piece. With right sides up chalk along the curve line. Turn right sides together, match chalk marks and pin perpendicular to edge. Ease fabric between pins and sew along pinned edge with a 1/4" seam allowance. Remove pins and iron seam in one direction. Arrange neckline on background fabric with right sides up. Pin in place. Hand stitch with matching thread using a hidden applique stitch. On backside carefully cut away as much bulk as possible from the collar. Trim background material to within a 1/4" of the appliqued seam. Next Monday, in Part 3 of the Mini Keepsake Quilt-Along, we will arrange and build sections like a puzzle into finished mini quilt. On Wednesday I'll announce the winner of the Whip Up Mini Quilt Book giveaway along with a review of the book. Did you learn anything about the way you see patterns by following your rhythm of attention? Any surprises? Please share! I am so impressed with all of the comments about ideas and materials for keepsake quilts, by those of you who entered the Whip Up Mini Quilt Book Giveaway. The possibilities are endless. If you have gathered your materials and are ready to begin, guess what? You have already completed the first, and one of the most significant steps, of the process. For those of you still on the fence, choose materials and pieces of clothing that resonate most strongly with memory and meaning. These will be the heart of your piece. Choose the most resonant materials for the heart of your piece. Supplement with less resonant pieces but good colors, texture, pattern, etc. Don't limit yourself to woven cotton materials. Anything goes except for leather. For a mini quilt try to limit yourself to two or three pieces. Beware of too many t-shirt logos. For the Mini Quilt that I created for Kathreen's book, I asked my friend Liz to provide only two pieces of clothing, one from her son's infancy and one from her pregnancy. These two pieces represented her passage into motherhood, while celebrating the life of her first child. A mini quilt is a small format so I recommend that you limit yourself to two or three pieces of clothing. Include more pieces if you want to make a larger quilt. The finished size of my mini quilt is only 30" x 24". 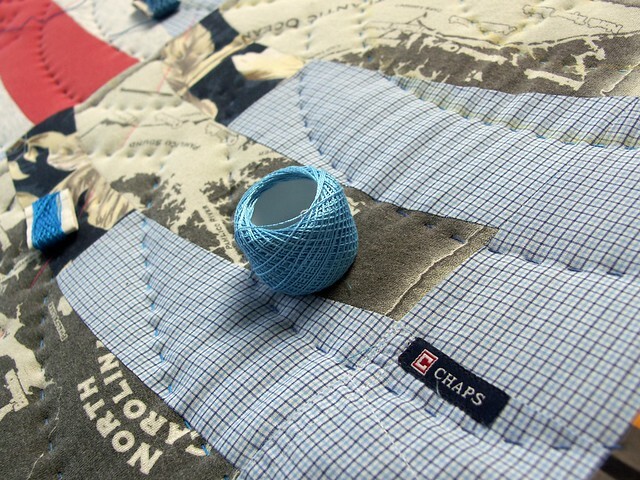 You can always cut your clothing into small squares and create a nine-patch keepsake quilt. However, Passage Quilting™ is about the process of transition, growth and healing. For this reason I work with the architecture of the clothing to create an improvised quilt without a predetermined pattern. As you begin to cut your clothing apart consider which architectural features you want to include in your quilt and cut accordingly. Cut the clothes along seam lines. Remove extra linings and bulky seams. Prep, cut apart, all of your materials before moving to the piecework. Next Monday, in Part 2 of the Keepsake Quilt-Along, we will begin making blocks or sections from our clothing parts. I will also review tips on improvisation and curve piecing techniques. What was it like to cut apart your meaningful materials? Was it liberating? Scary? Sad? Joyous? A relief? A surprise? A mixture of emotions? Please share! 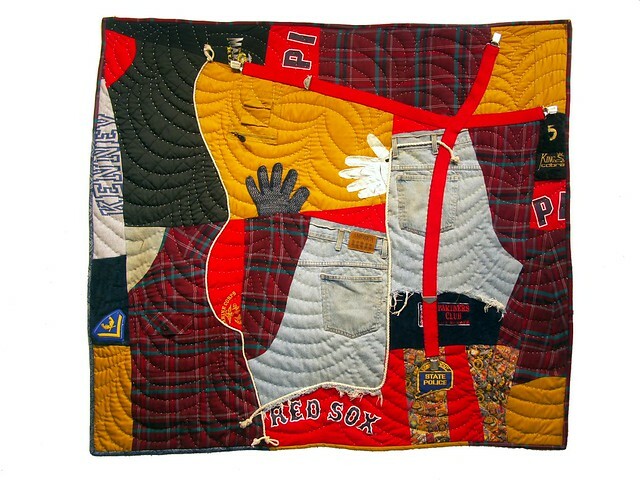 Walter F. Kenney, Jr. 2011, 54" x 48", machine and hand-pieced, hand-quilted, from the clothing of Walter F. Kenney, Jr.
Lauren Kenney asked me to make a memorial quilt out of her father's clothes as a gift for her mother. Lauren and her husband came to my studio with a few choice items of clothing, a gold coat beloved by her father in spite of her mother's sense of better taste, golf club covers, gloves, and towel, a favorite plaid shirt, old jean shorts and a pair of suspenders. Walter was a down to earth kind of guy who used a rope as a belt when working out in the yard. He served in the U.S. Marine Corps, and as a Connecticut state police officer, and was a loyal Red Sox fan. 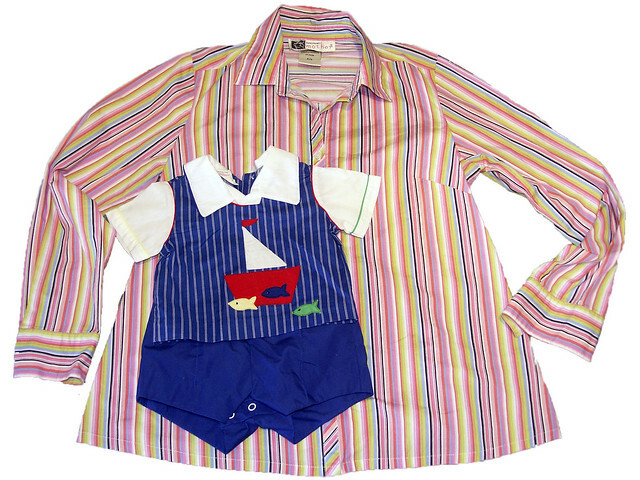 By his clothes, I can see that Walter had a colorful and bold personality! In December I was invited to lead a bereavement, memorial quilt making workshop in Cincinnati. Six people attended, each with the loss of a child, parent, or close friend. Everyone brought clothing of the person they were mourning to use as the material for their quilts. We began the two day workshop sitting around an alter we made of photographs of the ones we loved and lost. Each person brought one piece of clothing to the alter and shared the story that it contained. Soon we were cutting up the wedding dresses, the jeans, the soft baby toys, the nightgowns, and the work shirts of our beloved. After lunch the reconstruction began. We didn't have pre-determined patterns to follow. 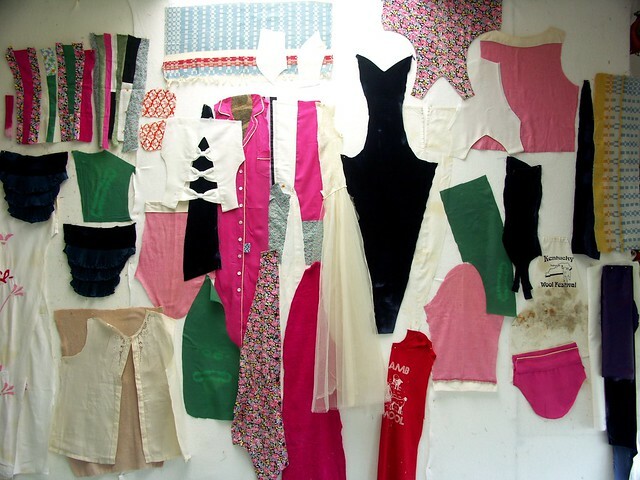 Each person worked intuitively and with the architecture of the clothing to reorder the fragments into new patterns and transformed relationships. The next day we sat around the alter again and shared the many insights that came up overnight because of the process. People brought relief, fear, anger, sadness, gratitude, compassion, love, and forgiveness to the table. No one's feeling or experience was left out. The group was able to hold everyone's different expressions of grief. We followed this time of sharing with another full day of cutting and sewing. We learned new patchwork and improvisational skills. We learned how to piece organically without rulers, how to sew knits, hand stitch delicate elements of clothing, and how to pull it all together into a composition. From my perspective it was an abundant time, full of sorrow, joy, friendship, and healing. If you are interested in finding out more: Passage Quilting™ is a hands-on bereavement process that I developed and began facilitating in the fall of 2001.